Jordan SharePoint User Group has recently conducted November 2009 meeting on Wednesday, November 11, 2009 at Princess Sumaya University for Technology. · InfoPath or ASP.NET Web Forms? 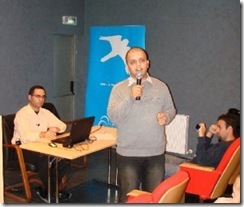 The Jordan SharePoint User Group (JSUG) is the very first SharePoint User Group in the Middle East. It was formed to connect SharePoint professionals within Jordan together, to share knowledge and build a higher level of awareness for SharePoint Products and Technologies within the region.